Population: 595.9 thousand habitants (2015). Capital: Phan Rang - Thap Cham City. Districts (6): Ninh Hai, Ninh Phuoc, Ninh Son, Bac Ai, Thuan Bac, Thuan Nam. Ethnic groups: Viet (Kinh), Cham, Ra Glai, Co Ho, Hoa. 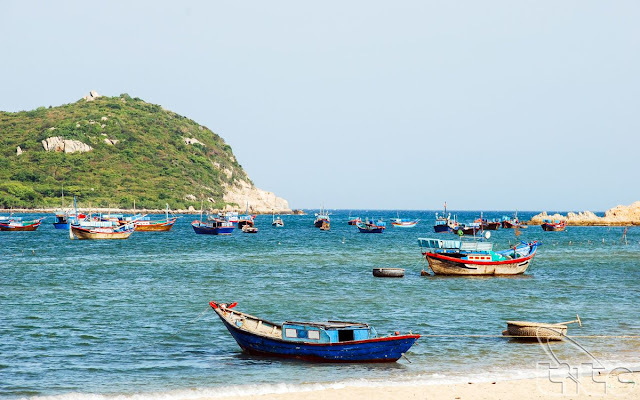 Located in South-Central Coast, Ninh Thuan shares border with Khanh Hoa Province on the north, Lam Dong Province on the west, Binh Thuan Province on the south and East Sea on the east. The terrain is a mixture of mountain, plain and seaside. Main rivers name Sat, Cai, Ong, Gia, Can, La, Quao. Mountains surround three faces of Ninh Thuan including Tha Nhonh, Chuan, Suong Mu, and Hon Dien mountains. Long seaside makes Da Vach, Thi, Ca Na capes and sea ports. Climate: The climate is a combination of the tropical monsoon and dry and windy weather. It is hot, dry, windy all of year. There is two seasons: the rain season lasts from May to November, the dry season lasts from December to April. Annual average temperature is 27oC. Ninh Thuan belongs to tourism triangles: Da Lat - Nha Trang - Phan Rang. Coming to there, tourists are able to relax in Ca Na Tourist Site, swim in Ninh Chu Beach, Vinh Hy Bay, climb to Da Trang Mountain, and observe natural animals in Phan Rang Reservation, or visit Pi Nang Tac Stone Trap. Being home of Cham minority group, Ninh Thuan has characters culture of Cham ethnic, which stamp in local custom, Cham dance, sculpture, pottery, and brocade and agriculture of Cham towers. Famous towers name Po Klong Garai and Porome. Road: Phan Rang - Thap Cham City is 105km south of Nha Trang, 110km east of Da Lat, 334km north of Ho Chi Minh City and 1,382km from Ha Noi. National Roads N°. 1 and N°. 27 running across the province. Train: The Reunification Express train between Ha Noi and Ho Chi Minh City stops at Thap Cham Railway Station. Besides, there is the local train from Thap Cham to Ho Chi Minh City (3 trips per day). VietnamTourism - good travel agency in vietnam, good care and support, unique tours, strange tours.